The Kansas State University Golf Course Management and Research Foundation is a 501 (c) (3) non-profit organization that has raised approximately $27 million since its inception to construct a first-class championship golf course facility for the community and university. In May 2010 a $5.4 million Clubhouse facility was built with the opening of Colbert’s Restaurant. Colbert Hills has hosted over 400,000 golf rounds on the Championship Course and over 75,000 golf course rounds on the Par 3 Course. Colbert Hills has been ranked #1 public golf course in Kansas every year & a Top 15 ranked collegiate golf course in the county. The Colbert Hills course record is a 64 (8-under) by Robert Streb, Spencer Alefs, James Marshall, and Drew Laning. Colbert Hills has hosted the 2002 Big 12 Women’s Golf Championship, 2003 NCAA Mens’ Central Regional Championship, 2005 Kansas Amateur, and 2012-16 Colbert Charity Classic professional golf event. There have been 281 graduates of the K-State Golf Course Management degree program that was created in conjunction with Colbert Hills. Over 40 research projects by Kansas State University faculty & students have been performed at Colbert Hills. The “Home of K-State Golf” has achieved several historical records the past 17 years for the K-State men’s and women’s golf programs, including the development of two PGA Tour players (Robert Streb & Aaron Watkins). The First Tee of Manhattan has taught life and golf skills to over 1,500 certifying youth participants in the community. 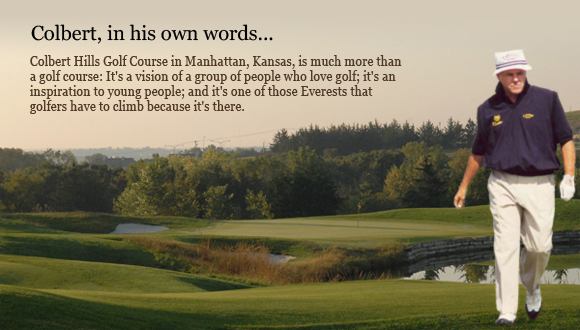 Colbert Hills and The First Tee of Manhattan have hosted The First Tee Life Skills & Leadership Academics to 1,000 youth participants from around the world. Colbert Hills has directly and indirectly generated an estimated $140 million in economic impact for the local community.